The innovative take on face cleansing; the new Castanea Arcadia Foaming Cream Cleanser complements the Castanea Arcadia collection, KORRES global innovation in antiageing, featuring the breakthrough molecule Active HALupeol™ that introduced for the first time in cosmetics the potent antiwrinkle power of pure lupeol. A rich, indulgent foaming cream that effectively removes impurities and make-up, without irritating, while it nourishes and tones, leaving skin soft and supple. 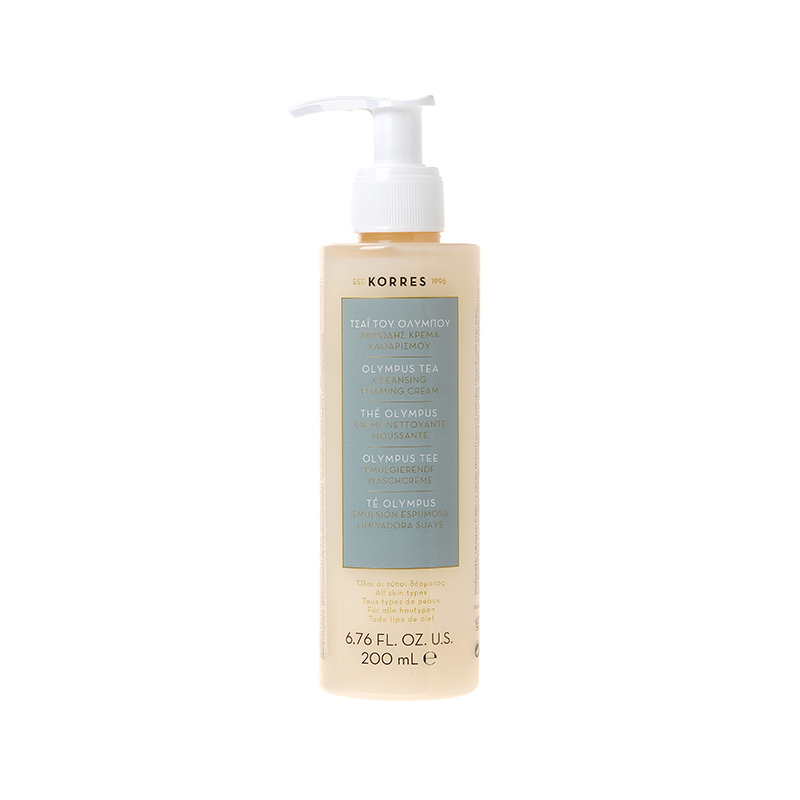 Suitable for all skin types, this cream-to-foam deep moisturising and nourishing cleanser, removes make-up and mascara effectively, gently cleansing the skin. Enriched with the innovative antioxidant and moisturising molecule, Active HALupeolTM, Castanea Arcadia extract - among world’s top natural antioxidants -, natural cleansing agents and emulsifiers, this is an efficient yet mild formula, perfectly compatible with eyes and skin. ANTIPOLLUTION, ANTIOXIDANT & DETOXIFYING A face cleansing collection with antipollution, antioxidant and detoxifying action. A formula that effectively removes impurities, face and eye make-up, external environmental pollutants and protects against toxins and environmental pollution, leaving skin smooth and supple. Olympus Tea, known for its antioxidant and anti-microbial properties, is combined with an exceptional active botanical blend that protects against environmental pollution. Available in two product formats - a leave-on cleansing emulsion and a foaming cleanser -, both offering a clean, smooth skin and a unique feel of freshness. OLYMPUS TEA / Extract of organic Tea from the foothills of Olympus mountain with exceptional antioxidant and antimicrobial properties. CITRUS, BROCOLLI & ALOE BLEND / An antioxidant blend of Citrus flavonoids, Broccoli and Aloe leaf extract, which protects skin cells against toxins and environmental pollution, while it activates detoxification enzymes. VITAMIN C / It offers even skin tone and antioxidant action. CALENDULA / It has soothing, calming, antiseptic action. PROVITAMIN Β5 / It has a powerful water-binding effect, acting as a skin moisturizer and improving skin texture. A massive cone-shaped mountain - the highest in Greece -, known as the abode of the 12 Gods of Greek mythology and the site of the throne of Zeus, leader of the Olympian Gods pantheon that prevailed over their predecessors, the Titans, following the 10-year Titanomachy. A world-renowned mountain with a unique mythical allure, from where the Olympians oversaw the world of the mortals. A yesteryear’s sacred spot that has now become an attraction for nature’ devotees from all over the world, aspiring to enjoy the best Greek landscape has to offer; tops blanketed in pure white snow and often shrouded in clouds and sides covered with thick forests of oak and beech trees. Mount Olympus is known for its unique biodiversity - it is home to 1,700 different plant species, some of which are rare or endemic; cannot be found anywhere else in the world. Olympus Tea grows at the foothills of the mountain. Its latin name Sideritis scardica stands for Ironwart that can be literally translated as the one made of iron, a plant considered so powerful that could even heal wounds caused by iron weapons in the battlefields. Local farmers, part of the brand’s fair-trade network, provide KORRES with organic Olympus Tea blossoms, grown with sustainable cultivation technics, protecting the species endangered wild populations. The delicate blossoms are then extracted at KORRES Herb Extraction Unit, to deliver their antioxidant and anti-microbial in KORRES new face cleansing collection.